As I sew, I find that I keep accumulating things. Fabric for projects I am going to sew, fabric for projects I don’t yet know what they will become and scraps. Then there are the items of clothing I refuse to throw out because they can be refashioned. Also, as new sewing machines, tools and notions are released on the market, I acquire those as well and really need to have practical storage for all of these things. A cluttered sewing space can affect your mood and make you feel as if you are unable to sew. Here are 6 clever storage ideas to help you manage your growing sewing supplies and better organize your space. 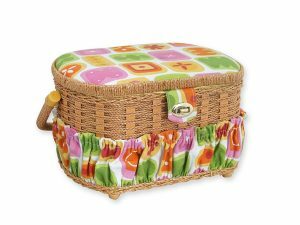 This Singer sewing storage basket has the appearance of a very stylish vintage picnic basket. The outer fabric covering has a lovely sewing themed pattern which lets you know exactly what it is for. The inner basket is actually made of wicker, as is the handle and the exposed parts of the lid. The full size of it is 10 ½’” x 8” x 6”. When you open the lid, you will find that there is a compartmentalized plastic tray on top to help you keep your tools and smaller items organized. 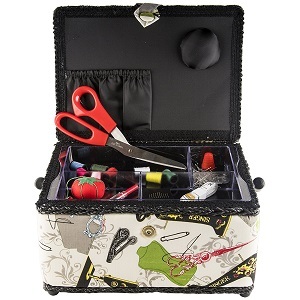 When you remove the tray it reveals an ample storage space beneath, where you can keep other tools, fabric and sewing supplies. 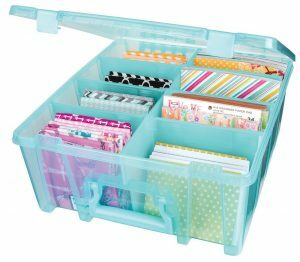 What I love about this storage basket is that fact that it comes with some basic items you need to start out sewing. These are: needles, straight pins, a pair of fabric shears, small spools of thread, a thimble, a needle threader, a round tomato pin cushion, a seam ripper, and a 60 inch tape measure. This is an excellent way to start out without having to pay extra for the same things you will definitely need. 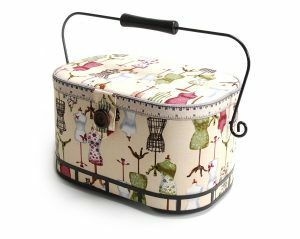 Also made of fabric, this sewing storage basket offers a little more space than the previous one, the dimensions being: 12″ x 6 3/8″ x 7 1/8″. The fabric design too is also an apt collection of sewing mannequins which contributes to its very appealing appearance. The rim of the lid is decorated with tape measure trim. The lid when closed is secured in place by a powerful magnet. This oval shaped basket can be carried by means of the metal handle with central wood trim. The central wooden piece creates the handle grip. The metal part of the handle ends in an interesting curved detail on either side. When you open the basket, you will find a pin cushion attached to the underside as well as a storage pocket. There is also a lift out tray for keeping smaller items organized. Remove this to access the lower section for storage of your other items. This storage basket is the smallest of the lot measuring in at 8 x 12 x 7 inches. Based on the design you can see half of the wicker and half of the fabric. The package includes a small collection of threads, needles, a seam ripper, an inch measure, metal bobbins and a needle threader. These come in a storage tray which sits at the bottom of the basket. An upper open storage area made of plastic lies on top for you to store your larger items. This means that to access the included accessories you have to lift the tray out. It really is not an inconvenience; just a different way of storing things. All in all this is a pretty compact storage option for the light sewer. I will now move to the plastic storage options. These tend to be quite popular with their compartmentalization. 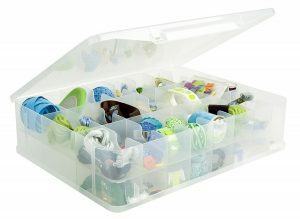 This white thread storage plastic art bin can accommodate various sizes of spools and has the dimensions 3½ ” x 14” X 15”. If the spools are 20 mm, it can accommodate 224 of them, for 32 mm spools, 108 and for 45 mm spools, 30. The thread spools stay in place whether the bin is stored flat or upright and the trays are removable. It has an opaque grey handle and two locks in place on either side of the bin. 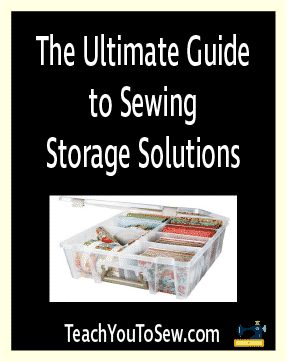 The next plastic storage solution offers storage far more than just thread. The extra deep bin comes fitted with dividers which you can remove to increase or reduce the spacing according to your needs. You may choose to completely remove the dividers if you need to which is termed as open core. The dimensions are 6 ¼’’ x 14’’ x 15 ¼’’. The carrying handle offers ease of transport and the two latches on either side snap closed securely. If you purchase more than one of these they are completely stackable to save space for storage in your home. 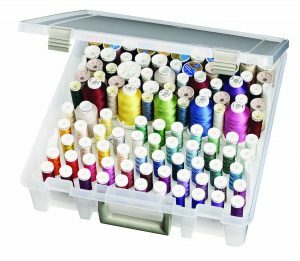 Although classified as a thread organizer, this plastic storage container can also be used to store small ribbons, bobbins and other small items you may use in sewing. It can comfortably store thread up to 3 x 1 1/2 inches in size. There are two levels of compartmentalization, which can be accessed from both the front and the back of the box. The two access doors are hinged and have plastic snaps for secure locking in place. They open in opposite directions and the fixed carry handle is located on one of the narrow sides of the bin. The dimensions of it are 14” x 10 ½” x 3”. It is clear in colour, made of molded plastic and has a total of 46 thread storage compartments.